Bauduin, Pierre et Alexander E. Musin (dir.) – Vers l’Orient et vers l’Occident. Regards croisés sur les dynamiques et les transferts culturels des Vikings à la Rous ancienne, Caen, Presses universitaires de Caen, 2014, 500 p.
Barton, Simon — Conquerors, Brides, and Concubines. Interfaith Relations and Social Power in Medieval Iberia, Philadelphie, University of Pennsylvania Press, 2015, 280 p.
Bonnell, Jennifer L. – Reclaiming the Don: An Environmental History of Toronto’s Don River Valley. Toronto: University of Toronto Press, 2014. Pp. 316. Clarke, Patrick D. (dir.) 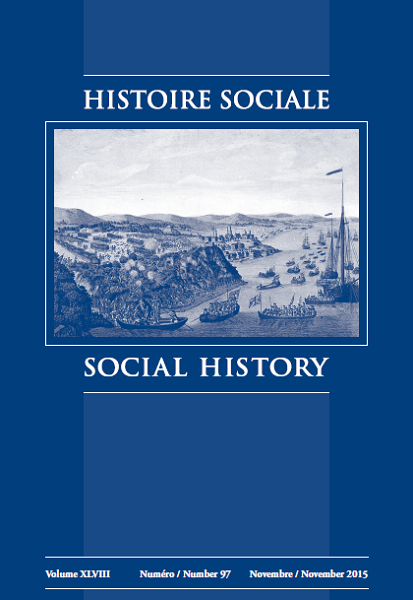 – Clio en Acadie : réflexions historiques, Québec, Presses de l’Université Laval, 2014, 272 p.
Curtis, Daniel R. – Coping with Crisis: The Resilience and Vulnerability of Pre-Industrial Settlements. Farnham: Ashgate, 2014. Pp. 381. Di Mascio, Anthony – The Idea of Popular Schooling In Upper Canada: Print Culture, Public Discourse, and the Demand for Education. Montreal and Kingston; McGill-Queen’s University Press, 2012. Pp. 257. Ingram, Darcy – Wildlife, Conservation, and Conflict in Quebec, 1840-1914. Vancouver: UBC Press, 2013. Pp. 272. Laderman, Scott & Edwin Martini (eds.) – Four Decades on: Vietnam, the United States, and the Legacies of the Second Indochina War. Durham and London: Duke University Press, 2013. Pp. 344. Matthews-Grieco, Sara F. (dir.) – Cuckoldry, Impotence and Adultery in Europe (15th-17th century), Farnham, Ashgate, 2014, 294 p.
McMeekin, Sean – The Russian Origins of the First World War, Cambridge, Harvard University Press, 2013, 344 p.
Smith, David E. – Across the Aisle: Opposition in Canadian Politics. Toronto: University of Toronto Press, 2013. Pp.228. Swyripa, Frances – Storied Landscapes: Ethno-Religious Identity and the Canadian Prairies. Winnipeg: University of Manitoba Press, 2010. Pp. 296. Thifault, Marie-Claude (dir.) – L’incontournable caste des femmes. Histoire des services de santé au Québec et au Canada, Ottawa, Presses de l’Université d’Ottawa, 2012, 370 p.
Wall, Karen L. – Game Plan: A Social History of Sport in Alberta. Edmonton: University of Alberta Press, 2012. Pp. 534. White, Bonnie – The Women’s Land Army in First World War Britain, Palgrave MacMillan, 2014, 207 p.